Abstract: Resistance developments against established antibiotics are an emerging problem for antibacterial therapies. Infections with Staphylococcus aureus and methicillin-resistant S. aureus (MRSA) have become more difficult to treat with standard antibiotics that often fail, especially against MRSA. In consequence, novel antibiotics are urgently needed. Antibiotics from natural sources own complicated structures that cause difficulties for a chemical synthetic production. We developed novel small-molecule antibacterials that are easily accessible in a simple one-pot synthesis. The central indolonaphthalene core is substituted with indole residues at various positions. Both the varied indole substitutions and their positions at the molecular scaffold influence the determined antibacterial activity against the evaluated Staphylococcus strains. Best activities have been found for 5-chloro, -cyano, and -hydroxyl indole substitutions. Therefore, first promising lead compounds could be identified that are nontoxic in human HEK and SH-SY5Y cells and exceed the activity of used standard antibiotics, especially against MRSA. 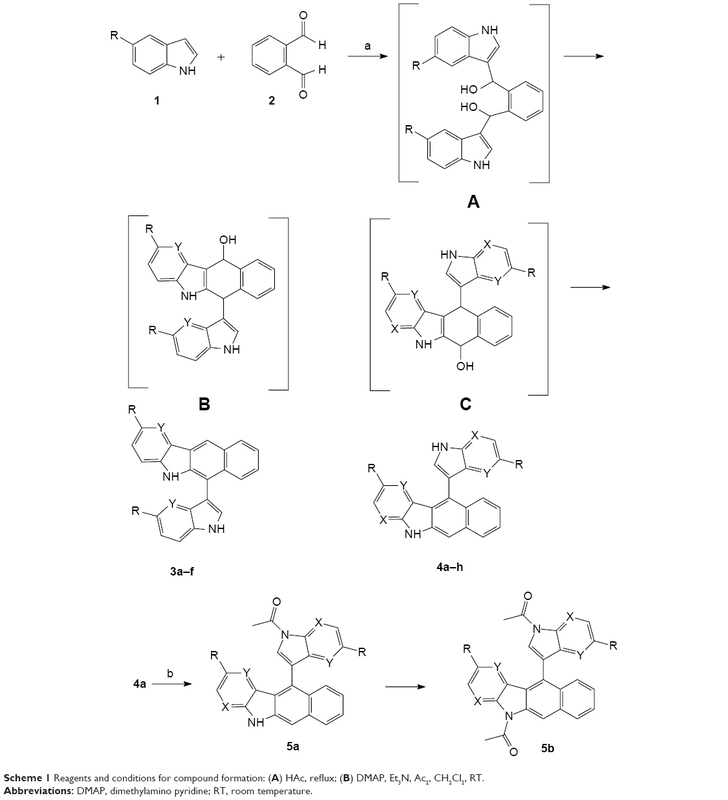 Natural sources like plants, marine fungi, and bacteria have gained increasing interest in the search for novel antibiotics.14–18 Isolated indolophenanthridines from cyanobacteria showed residual antibacterial activities.19 Other indole containing compounds with attached aromatic or heteroaromatic nuclei have been reported to exert some antimicrobial activities.20–22 The isolated yields of these compounds from their natural sources are poor and the synthetic access to such compounds is limited, partly due to sterically complicated substructures which are difficult to synthesize.22,23 A recent synthetic access to indolonaphthalenes with an unfavorable quinone core has been reported in a seven-step procedure.24 We gained synthetic access to indolo[2,3-b]naphthalenes without such a critical quinone core in a simple one-step procedure under mild conditions using acetic acid and substituted indoles that reacted with o-phthaldialdehyde. The antimicrobial activities toward S. aureus including MRSA have been evaluated and first lead compounds with promising activities have been identified. O-phthaldialdehyde (1 mmol) was dissolved in glacial acetic acid (15 mL). Then, the corresponding indole (2 mmol) was added to the solution. The mixture was stirred under reflux conditions as long as all of the starting o-phthaldialdehyde disappeared according to thin layer chromatography (TLC)-monitoring in CH2Cl2 (100%), which meant reaction times of a few hours. The reaction mixture was worked up by neutralizing the acid with NaOH (10%) and extraction with CH2Cl2 (50 mL) for three times. The organic layer was washed with both water and brine, each for three times. Then, it was dried over sodium sulfate, filtered, and concentrated in vacuum. The reaction products 3 and 4, respectively, were given after column chromatography from all the collected and unified compound fractions after solvent evaporation. Column chromatography was carried out with silica gel and either ethyl acetate or diethyl ether mixtures with cyclohexane as eluents. 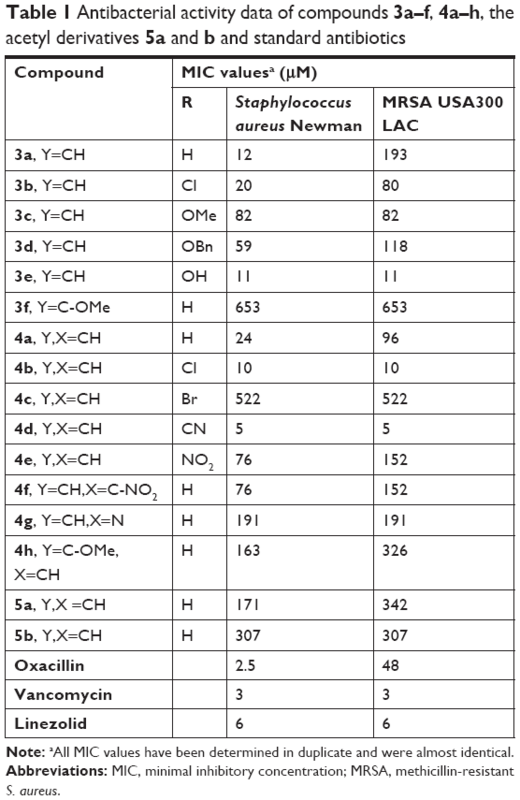 The mixtures in the following percentages have been used: ethyl acetate/cyclohexane 15/85 for compounds 4c and 4f, 50/50 for compound 3e and 60/40 for compounds 4e and 4g and diethyl ether/cyclohexane 30/70 for compounds 3a, 3c, 3d, 3f, 4a, and 4h and 50/50 for compounds 3b, 4b, and 4d. For acetylation, compound 4a (0.6 mmol) was dissolved in CH2Cl2 (3 mL). Dimethylamino pyridine (0.06 mmol) and triethylamine (0.7 mmol) were added as basic auxiliaries to abstract the relevant indole nitrogen protons. Finally, acetic anhydride (0.7 mmol) was used as an acetylating agent. The reaction mixture was left stirring for several weeks. The product formation was observed by TLC until no more changes were noticed. Then, the solution was neutralized with ammonia and extraction followed with CH2Cl2 for three times. The organic layer was washed with water and brine for three times and then dried over sodium sulfate. After filtration, the acetylated products 5a and 5b were given by column chromatography over silica gel using a mixture of ethyl acetate and cyclohexane in a ratio of 35%:65%. All experimental data of the compounds are summarized in Supplementary materials. The minimal inhibitory concentrations (MIC) of all compounds and standard antibiotics were determined by microdilution according to the recommendations of the Clinical and Laboratory Standard Institute guidelines.25 Standard antibiotics oxacillin, vancomycin, and linezolid were purchased from Sigma-Aldrich (Taufkirchen, Germany). The MICs were determined in 96-well microtiter plates using a final volume of 100 μL Mueller Hinton Broth (MHB) containing beef infusion solids (20 g/L), casein hydrolysate (17.5 g/L), and starch (1.5 g/L). For MIC determination against oxacillin, 2% sodium chloride was added. The compounds and standard antibiotics linezolid and vancomycin (Table 1) were dissolved in dimethyl sulfoxide (DMSO) and diluted with MHB to a final concentration of 512 μg/mL containing 12.5% DMSO. The chosen DMSO percentage should avoid any precipitation during the following dilution procedures of the compounds which easily dissolved in the undiluted stock solution. The 12.5% DMSO has been used as a negative control. Further dilutions of the compounds and standard drugs in the test medium were prepared at the required quantities of 256, 128, 64, 32, 16, 8, 4, 2, 1, 0.5 and 0.25 μg/mL concentrations with MHB serially decreasing the final DMSO percentage. Oxacillin was dissolved in H2O at a concentration of 50 mg/mL, and further diluted in MHB to the same concentrations as the compounds and other standard antibiotics. All the compounds were tested in duplicate for their in vitro growth inhibitory activity against S. aureus Newman and MRSA USA300 LAC. Both strains belong to the S. aureus clonal complex 8 and are highly pathogenic.26,27 S. aureus strain Newman was isolated in 1952 from a human infection and owns a general antibiotic susceptibility due to a lack of drug resistance genes.28,29 MRSA USA300 strain LAC, as MRSA, confers resistance toward β-lactam antibiotics by the acquired mecA gene that encodes alternative transpeptidase penicillin binding protein 2a with a low affinity to the β-lactam antibiotics.30 The final inoculum size was 5×105 CFU/mL for the antibacterial assay. A set of tubes containing only inoculated broth was used as controls. After incubation for 20 hours at 36°C±1°C, the last tube with no growth of microorganisms determined by visual examination under an inverse microscope was recorded to represent the MIC (expressed in μM). Note: aAll MIC values have been determined in duplicate and were almost identical. Abbreviations: MIC, minimal inhibitory concentration; MRSA, methicillin-resistant S. aureus. Human HEK293 cells (DSMZ Braunschweig, ACC-305) and SH-SY5Y cells (DSMZ Braunschweig, ACC-209) were incubated at 37°C in a humidified incubator with 5% CO2 in DMEM supplemented with 10% fetal calf serum and 5 mM L-glutamine (both Biochrom). Cells were seeded out at 1.5×103 cells per well in a 96-well cell culture plate (TPP Techno Plastic Products AG, Trasadingen, Switzerland). The compounds were added immediately to the medium at the given concentrations. After 24 and 48 hours, respectively, AlamarBlue® reagent (Invitrogen, Carlsbad, CA, USA) was added according to the manufacturer’s instructions and incubated again for 6 hours before samples were analyzed. Detection of viable cells, which convert AlamarBlue reagent into the high fluorescent product, was performed by using a FLUOstar OPTIMA microplate reader (BMG Labtec) with the following filter set: Ex560 nm/Em590 nm. All measurements were performed in triplicates. For our target compound synthesis, we mixed two equivalents of the indole 1 and one equivalent of the o-phthaldialdehyde 2 in the respective acetic acid volume. We observed the formation of two differently substituted indolonaphthalenes 3 and 4, one with the indolyl residue attached to the 6- and one with the indolyl residue attached to the 11-position of the molecular scaffold (Scheme 1). Scheme 1 Reagents and conditions for compound formation: (A) HAc, reflux; (B) DMAP, Et3N, Ac2, CH2Cl2, RT. Abbreviations: DMAP, dimethylamino pyridine; RT, room temperature. The first antibacterial screening of our novel compounds has been carried out against S. aureus strain Newman and MRSA strain USA300 LAC in a bacterial growth assay with standard concentrations to determine the MIC, which is defined as the concentration which completely inhibited bacterial growth. Compound 3a with the unsubstituted indole residue at the 6-position of the molecular scaffold resulted in an MIC value of 12 μM against S. aureus Newman (Table 1). However, the activity against MRSA USA300 LAC was only residual with an MIC value of 193 μM. The 5-chloro indolyl compound 3b showed a reduced S. aureus Newman activity with an MIC value of 20 μM. The MRSA USA300 LAC activity increased compared with the unsubstituted derivative 3a. The 5-methoxy indolyl residue in derivative 3c caused a further reduced S. aureus Newman activity, whereas the MRSA USA300 LAC activity remained unchanged compared with the 5-chloro compound 3b. If the 5-methoxy function was replaced with a 5-benzyloxy function in derivative 3d, the S. aureus Newman activity increased, whereas the MRSA USA300 LAC activity decreased. All our 5-substituents so far may serve as a potential hydrogen bond acceptor function in addressing a bacterial target structure. If that hydrogen acceptor function was replaced with a 5-hydroxy function in compound 3e, which may serve as a potential hydrogen bond donator function, we found MIC values of each 11 μM for S. aureus Newman and MRSA USA300 LAC. The activity toward S. aureus Newman was similar to that of the 5-unsubstituted compound 3a, but significantly increased toward MRSA USA300 LAC and thus partly exceeds that of the used antibiotics. If the 5-methoxy function in compound 3c moved to the 4-position in derivative 3f, the activity toward both S. aureus strains was completely lost. Consequently, a substituent in the 4-position seems to be unfavorable. The unsubstituted indolyl residue in the 11-position of the molecular scaffold resulted in an MIC value of 24 μM for compound 4a. The activity toward MRSA USA300 LAC was determined with an MIC value of 96 μM. Thus, the activity toward S. aureus Newman was reduced compared with derivative 3a with the indolyl residue in the 6-position of the molecular scaffold, whereas the activity toward MRSA USA300 LAC was increased. The 5-chloro substitution of compound 4b caused mainly improved activities toward both S. aureus Newman and MRSA USA300 LAC with MIC values of each 10 μM. A replacement of the 5-chloro with a more bulky 5-bromo function in derivative 4c led to a loss of activity toward both strains. If the 5-chloro substitution was replaced with a cyano function in compound 4d, we found an increase of activities against both strains with MIC values of each 5 μM. The activity toward MRSA USA300 LAC is in the range of the reserve antibiotics against MRSA vancomycin and linezolid with 3 μM for vancomycin and 6 μM for linezolid. A 5-nitro function as electron withdrawing function in compound 4e mainly decreased the activity toward both S. aureus strains. If that 5-nitro function moved to the 7-indole position in compound 4f, the activities remained unchanged. We then replaced the 7-nitro function with a ring aza function in derivative 4g and observed a further decrease in the activity toward S. aureus demonstrating that 7-indole substitutions are not favorable. A methoxy function placed in the 4-position of the indole in compound 4h was also unfavorable with just a residual activity toward S. aureus Newman and a loss of activity toward MRSA USA300 LAC. The most active compound 4d has been tested in other S. aureus strains to confirm the results. For these tests, we selected five strains of different origin: the two MRSA strains N315 and COL, the vancomycin-resistant strain Mu50 and methicillin-sensitive clinical isolates belonging to the sequence type ST8, and a strong biofilm-forming strain belonging to ST228. The results revealed a high activity of 4d against all five S. aureus strains ranging from an MIC of 2.5 μM (strain N315, Mu50) to10 μM (strain COL, ST8, and ST228). Then acetylation reactions of the indole nitrogen atoms of selected compound 4a have been carried out to get insight into the importance of the N-hydrogen atoms for the antibacterial activity. Compound 4a dissolved in dichloromethane under addition of 4-(dimethylamino) pyridine as catalyst, acetic anhydride as acetylation reagent, and triethylamine as basic auxiliary reacted under stirring for several weeks at room temperature. Both, a monoacetylated and a diacetylated compound, could be isolated from the reaction mixture of compound 4a. The monoacetylated compound 5a with the acetyl function attached to the nitrogen atom of the 11-indole residue showed a mainly reduced activity toward S. aureus Newman with an MIC value of 171 μM. The MRSA activity was practically lost. The diacetylated compound 5b showed a complete loss of the S. aureus activity. Thus, both NH functions play an important role in the antibacterial activity as demonstrated in the test series. Next, we evaluated the toxicity of our most active compounds from both series 3 and 4 toward human HEK cells. We used compound concentrations in the range of the determined concentrations for the total antibacterial growth inhibition to assess antibacterial compound activity compared to effects toward human cells. In the assay system, a nonfluorescent dye is converted to the red-fluorescent resorufin by reduction via the mitochondrial dehydrogenases of metabolically active HEK cells. 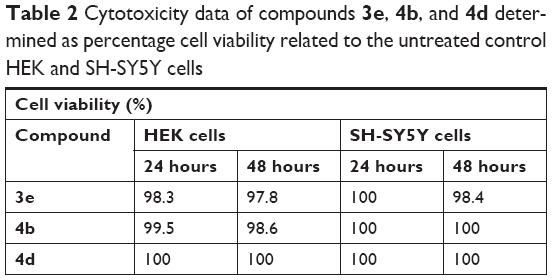 The percentage viability of the cells related to the untreated control cells has been determined for each 24 and 48 hours of incubation with the compounds at the given relevant concentrations of 4 μM for 3e and 4b and of 2 μM for 4d (Table 2). In case of compound 3e, 97.8% of the cells were viable after 48 hours and 98.3% after 24 hours. Using compound 4b, 98.6% of the cells were viable after 48 hours and 99.5% after 24 hours. In case of compound 4d, all cells were viable after 48 and 24 hours, respectively. So, it can be concluded that all compounds are completely nontoxic at the relevant concentrations. The results were confirmed by additional testing in human neuroblastoma SH-SY5Y cells under the same conditions as shown in Table 2. The authors acknowledge the support of their work by the Bundesministerium für Bildung und Forschung program “Target validation for pharmaceutical drug compound development”, project PyrBac. Ventola CL. The antibiotic resistance crisis: part 1: causes and threats. Pharm Ther. 2015;40:277–283. World Health Organization. Antibiotic resistance [updated February 5, 2018]; 2018. Available from: http://who-int/news-room/fact-sheets/detail/antibiotic-resistance. Accessed December 21, 2018. Tanday S. Resisting the use of antibiotics for viral infections. Lancet Respir Med. 2016;4(3):179. Bhat JA, Tenguria R. Significance of MRSA in nosocomial infections. Int J Appl Sci. 2014;1:27–36. Nichols H. All you need to know about MRSA. Medical News Today [serial on the Internet]. 2017; 2018. https://www.medicalnewstoday.com/articles/10634.php. Accessed October 4, 2018. Durai R, Ng PC, Hoque H. Methicillin-resistant Staphylococcus aureus: an update. AORN J. 2010;91(5):599–609. European Centre for Disease Prevention and Control. Annual Epidemiological Report 2014. Antimicrobial Resistance and Healthcare-Associated Infections. Stockholm: ECDC; 2015. Rossolini GM, Arena F, Pecile P, Pollini S. Update on the antibiotic resistance crisis. Curr Opin Pharmacol. 2014;18:56–60. Read AF, Woods RJ. Antibiotic resistance management. Evol Med Public Health. 2014;2014(1):147. Gould IM. Is vancomycin redundant for serious staphylococcal infection? Int J Antimicrob Agents. 2010;36(Suppl 2):S55–S57. Sanchez GM, De La Torre MA, Morales G, et al. Clinical outbreak of linezolid-resistant Staphylococcus aureus in an intensive care unit. JAMA. 2010;303:2260–2263. Mohamed MF, Abdelkhalek A, Seleem MN. Evaluation of short synthetic antimicrobial peptides for treatment of drug-resistant and intracellular Staphylococcus aureus. Sci Rep. 2016;6:1–12. Kumar P, Kizhakkedathu J, Straus S. Antimicrobial peptides: diversity, mechanism of action and strategies to improve the activity and biocompatibility in vivo. Biomolecules. 2018;8(1):4. Abdallal EM. Plants: an alternative source for antimicrobials. J Appl Pharm Sci. 2011;1:16–20. Caproruscio J. Can natural antibiotics be found in plants? Medical news Bulletin [serial on Internet]. 2018: 2018. https://medicalnewsbulletin.com/natural-antibiotics-plant. Accessed October 4, 2018. Nielsen JC, Grijseels S, Prigent S, et al. Global analysis of biosynthetic gene clusters reveals vast potential of secondary metabolite production in Penicillium species. Nat Microbiol. 2017;2:17044. Imhoff JF. Natural products from marine fungi – still an underrepresented resource. Mar Drugs. 2016;14(1):19. Biswas K, Paul D, Sinha SN. Marine bacteria: a potential tool for antibacterial activity. J Appl Environ Microbiol. 2016;4:25–29. Xu S, Nijampatnam B, Dutta S, Velu SE. Cyanobacterial metabolite calothrixins: recent advances in synthesis and biological evaluation. Mar Drugs. 2016;14(1):17–37. Singh P, Verma P, Verma P, Yadav B, Komath SS. Synthesis and evaluation of indole-based new scaffolds for antimicrobial activities – identification of promising candidates. Bioorg Med Chem Lett. 2011;21(11):3367–3372. Salman AS, Mahmoud NA, Abdel-Aziem A, Mohamed MA, Elsisi DM. Synthesis, reactions and antimicrobial activity of some new 3-substituted indole derivatives. Int J Organ Chem. 2015;05(02):81–99. Paudel A, Hamamoto H, Kobayashi Y, Yokoshima S, Fukuyama T, Sekimizu K. Identification of novel deoxyribofuranosyl indole antimicrobial agents. J Antibiot. 2012;65(2):53–57. Cushnie TP, Cushnie B, Lamb AJ. Alkaloids: an overview of their antibacterial, antibiotic-enhancing and antivirulence activities. Int J Antimicrob Agents. 2014;44(5):377–386. Fernandez M, Barcia C, Estévez JC. A novel total synthesis of indolo[2,3-b]naphthalene-6,11-diones. Synlett. 2004;2:267–270. CLSI. Methods for Dilution Antimicrobial Susceptibility Tests for Bacteria That Grow Aerobically; Approved Standard. 10th ed. CLSI document M07-A10. Wayne, PA: Clinical and Laboratory Standards Institute; 2015. Bowers JR, Driebe EM, Albrecht V, et al. Improved subtyping of Staphylococcus aureus clonal complex 8 strains based on whole-genome phylogenetic analysis. mSphere. 2018;3(3):e00464–17. Herbert S, Ziebandt AK, Ohlsen K, et al. Repair of global regulators in Staphylococcus aureus 8325 and comparative analysis with other clinical isolates. Infect Immun. 2010;78(6):2877–2889. Duthie ES, Lorenz LL. Staphylococcal coagulase: mode of action and antigenicity. Microbiology. 1952;6(1–2):95–107. Baba T, Bae T, Schneewind O, Takeuchi F, Hiramatsu K. Genome sequence of Staphylococcus aureus strain Newman and comparative analysis of staphylococcal genomes: polymorphism and evolution of two major pathogenicity islands. J Bacteriol. 2008;190(1):300–310. Baek KT, Gründling A, Mogensen RG, et al. β-Lactam resistance in methicillin-resistant Staphylococcus aureus USA300 is increased by inactivation of the ClpXP protease. Antimicrob Agents Chemother. 2014;58(8):4593–4603. El-Sayed MT, Mahmoud KA, Heinemann FW, Hilgeroth A. Novel tetraindoles and unexpected cycloalkane indoles from the reaction of indoles and aliphatic dialdehydes. J Heterocycl Chem. 2017;54(1):714–719. Guangzhi X, Yuzhen W, Zhuting W. The nuclear magnetic resonances of carbazole derivatives. Scientia Sinica. 1980;23:6–10. Wiebach V, Mainz A, Siegert MJ, et al. The anti-staphylococcal lipolanthines are ribosomally synthesized lipopeptides. Nat Chem Biol. 2018;14(7):652–654. Commercial reagents were used without further purification. The 1H-NMR spectra (400 MHz) were measured using tetramethylsilane as an internal standard. Thin layer chromatography was performed on E. Merck 5554 silica gel plates. The high-resolution mass spectra were recorded on a Finnigan LCQ Classic mass spectrometer. 6-(1H-Indol-3-yl)-5H-benzo[b]carbazole (3a): Yield 4%; mp 115°C–120°C; IR (ATR) ν =3411 (NH) cm−1; 1H NMR (acetone-d6) δ =10.69 (s, 1H, NH), 9.77 (s, 1H, NH), 8.72 (s, 1H, 11-H), 8.31 (m, 1H), 8.15 (m, 1H), 7.91 (ddd, J =8.3, 1.7, 0.8 Hz, 1H), 7.64 (m, 2H), 7.39 (m, 4H), 7.19 (m, 3H), 7.0 (ddd, J =8.0, 6.9, 1.0 Hz, 1H); m/z (ESI) 333.1 (M+H+). 2-Chloro-6-(5-chloro-1H-indol-3-yl)-5H-benzo[b]carbazole (3b): Yield 9%; mp 255°C–260°C; IR (ATR) ν =3418 (NH), 1610 (C−Cl) cm−1; 1H NMR (acetone-d6) δ =11.79 (s, 1H, NH), 10.66 (s, 1H, NH), 8.79 (s, 1H, 11-H), 8.37 (d, J =2.0 Hz, 1H), 8.11 (m, 1H), 8.0 (s, 1H), 7.90 (m, 1H), 7.78 (m, 1H), 7.42 (m, 3H), 7.21 (m, 2H), 6.91 (d, J =2.2 Hz, 1H); m/z (ESI) 402.1 (M+H+). 2-Methoxy-6-(5-methoxy-1H-indol-3-yl)-5H-benzo[b]carbazole (3c): Yield 4%; mp 105°C–110°C; IR (ATR) ν =3411 (NH), 1063 (OCH3) cm−1; 1H NMR (acetone-d6) δ =10.55 (s, 1H, NH), 9.55 (s, 1H, NH), 8.69 (s, 1H, 11-H), 8.12 (m, 1H), 7.92 (m, 2H), 7.62 (m, 1H), 7.52 (m, 1H), 7.37 (m, 3H), 7.08 (dd, J =8.7, 2.5 Hz, 1H), 6.86 (dd, J =8.8, 2.5 Hz, 1H), 6.61 (dd, J =7.5, 1.5 Hz, 1H), 3.94 (s, 3H, OCH3), 3.88 (s, 3H, OCH3); m/z (ESI) 391.53 (M−H+). 2-Benzyloxy-6-(5-benzyloxy-1H-indol-3-yl)-5H-benzo[b]carbazole (3d): Yield 22%; mp 100°C–105°C; IR (ATR) ν =3415 (NH), 1268 (C−O) cm−1; 1H NMR (acetone-d6) δ =10.57 (s, 1H, NH), 9.57 (s, 1H, NH), 8.68 (s, 1H, 11-H), 8.13 (m, 1H), 8.01 (m, 1H), 7.91 (m, 1H), 7.63–7.53 (m, 5H), 7.42–7.19 (m, 11H), 6.98 (m, 1H), 6.75 (dd, J =7.4, 1.6 Hz, 1H), 5.03 (s, 2H, OCH2), 5.01 (s, 2H, OCH2); m/z (ESI) 543.26 (M−H+). 2-Hydroxy-6-(5-Hydroxy-1H-indol-3-yl)-5H-benzo[b]carbazole-2-ol (3e): Yield 17%; mp 205°C–210°C; IR (ATR) ν =3402 (NH) cm−1; 1H NMR (DMSO-d6) δ =11.22 (s, 1H, NH), 10.06 (s, 1H, NH), 8.96 (s, 1H, 11-H), 8.56 (s, 1H, OH), 8.48 (s, 1H, 11-H), 8.10 (s, 1H, OH), 7.76–7.23 (m, 7H), 6.89 (m, 1H), 6.66 (m, 1H), 6.34 (dd, J =7.5, 1.5 Hz, 1H); m/z (ESI) 365.2 (M+H+). 1-Methoxy-6-(4-methoxy-1H-indol-3-yl)-5H-benzo[b]carbazole (3f): Yield 3%; mp 165°C–170°C; IR (ATR) ν =3413 (NH), 1060 (OCH3) cm−1; 1H NMR (acetone-d6) δ =10.24 (s, 1H, NH), 8.76 (s, 1H, NH), 8.06 (s, 1H, 11-H), 7.95 (m, 1H), 7.83 (s, 1H), 7.44 (m, 4H), 7.36 (m, 3H), 7.12 (dd, J =7.3, 1.7 Hz, 1H), 6.80 (dd, J =6.1, 2.8 Hz, 1H), 4.15 (s, 6H, OCH3); m/z (ESI) 393.21 (M+H+). 11-(1H-indol-3-yl)-5H-benzo[b]carbazole (4a): Yield 23%; mp 255°C–260°C; IR (ATR) ν =3407 (NH) cm−1; 1H NMR (acetone-d6) δ =10.47 (s, 1H, NH), 10.29 (s, 1H, NH), 8.02 (m, 1H), 7.94 (s, 1H, 6-H), 7.89 (m, 1H), 7.68 (dt, J =8.3, 1.0 Hz, 1H), 7.57 (d, J =2.3 Hz, 1H), 7.44 (dt, J =8.1, 1.2 Hz, 2H), 7.26 (m, 3H), 7.06–6.89 (m, 3H), 6.75 (m, 1H); m/z (ESI) 333.2 (M+H+). 2-Chloro-11-(5-chloro-1H-indol-3-yl)-5H-benzo[b]carbazole (4b): Yield 37%; mp 230°C–235°C; IR (ATR) ν =3409 (NH) cm−1, 1609 (C−Cl); 1H NMR (DMSO-d6) δ =11.83 (s, 1H, NH), 11.45 (s, 1H, NH), 8.06 (m, 1H), 7.95 (s, 1H, 6-H), 7.69 (m, 3H), 7.45 (m, 2H), 7.34 (d, J =7.6 Hz, 1H), 7.25 (m, 2H), 6.78 (d, J =2.0 Hz, 1H), 6.72 (d, J =2.1 Hz, 1H); m/z (ESI) 402.1 (M+H+). 2-Bromo-11-(5-bromo-1H-indol-3-yl)-5H-benzo[b]carbazole (4c): Yield 50%; mp 245°C–250°C; IR (ATR) ν =3408 (NH) cm−1, 1604 (C−Br); 1H NMR (DMSO-d6) δ =11.85 (s, 1H, NH), 11.46 (s, 1H, NH), 8.07 (m, 1H), 7.96 (s, 1H, 6-H), 7.70 (m, 2H), 7.60 (m, 1H), 7.47 (m, 3H), 7.30 (m, 2H), 6.93 (d, J =1.9 Hz, 1H), 6.88 (d, J =2.0 Hz, 1H); m/z (ESI) 491.2 (M+H+). 11-(5-Cyano-1H-indol-3-yl)-5H-benzo[b]carbazole-2-carbonitrile (4d): Yield 12%; mp 210°C–215°C; IR (ATR) ν =3311 (NH) cm−1, 2219 (CN); 1H NMR (acetone-d6) δ =11.43 (s, 1H, NH), 10.97 (s, 1H, NH), 8.10 (m, 2H), 7.92 (m, 2H), 7.84 (m, 1H, 6-H), 7.70–7.60 (m, 2H), 7.60–7.54 (m, 2H), 7.43 (m, 2H), 7.19 (m, 1H); m/z (ESI) 383.6 (M+H+). 2-Nitro-11-(5-nitro-1H-indol-3-yl)-5H-benzo[b]carbazole (4e): Yield 20%; mp 140°C–150°C; IR (ATR) ν =3350 (NH) cm−1, 1324 (NO2); 1H NMR (DMSO-d6) δ =12.51 (s, 1H, NH), 12.23 (s, 1H, NH), 8.57 (d, 1H, J =2.3 Hz, 1H), 8.26 (dd, J =8.9, 2.3 Hz, 1H), 8.19 (dd, 1H, J =8.4, 2.4 Hz, 1H), 8.16 (s, 1H), 8.13 (d, J =8.4 Hz, 1H), 8.06 (d, J =2.4 Hz, 1H), 7.98 (dt, J =8.9, 2.4 Hz, 1H), 7.89 (d, J =8.9 Hz, 1H), 7.77 (dd, J =8.9, 2.4 Hz, 1H), 7.70 (d, 1H, J =2.3 Hz), 7.56 (dt, J =8.9, 1.8 Hz, 1H), 7.36 (dd, J =8.9, 1.8 HZ, 1H); m/z (ESI) 423.1 (M+H+). 4-Nitro-11-(7-nitro-1H-indol-3-yl)-5H-benzo[b]carbazole (4f): Yield 55%; mp >320°C; IR (ATR) ν =3400 (NH) cm−1, 1330 (NO2); 1H NMR (DMSO-d6) δ =12.47 (s, 1H, NH), 12.30 (s, 1H, NH), 10.46 (s, 1H), 8.26 (m, 1H), 8.14 (dd, J =7.5, 1.5 Hz, 1H), 7.99 (dd, J =7.4, 1.6 Hz, 1H), 7.85 (m, 1H), 7.70 (m, 1H), 7.55 (m, 1H), 7.37 (m, 2H), 7.10 (m, 2H), 6.97 (t, J =7.5 Hz, 1H); m/z (ESI) 423.4 (M+H+). 5-(1H-pyrrolo[2,3-b]pyridine-3-yl)-11H-benzo[f]pyrido[2,3-b]indole (4g): Yield 12%; mp >320°C; IR (ATR) ν =3134 (NH), 1330 (C=N) cm−1; 1H NMR (DMSO-d6) δ =12.18 (s, 1H, NH), 11.83 (s, 1H, NH), 8.31 (m, 2H), 8.09 (m, 1H), 7.93 (s, 1H), 7.79 (m, 2H), 7.48 (ddd, J =8.1, 6.6, 1.2 Hz, 1H), 7.29 (m, 2H), 7.05 (s, 1H), 6.98 (m, 1H), 6.84 (m, 1H); m/z (ESI) 335.7 (M+H+). 1-Methoxy-11-(4-methoxy-1H-indol-3-yl)-5H-benzo[b]carbazole (4h): Yield 2%; mp 165°C–170°C; IR (ATR) ν =3313 (NH), 1058 (OCH3) cm−1; 1H NMR (acetone-d6) δ =10.25 (s, 1H, NH), 8.76 (s, 1H, NH), 8.06–7.93 (m, 3H), 7.83 (s, 1H, 11-H), 7.43–7.35 (m, 6H), 7.12 (dd, J =7.3, 1.7 Hz, 1H), 6.80 (dd, J =6.1, 2.8 Hz, 1H), 4.15 (s, 6H, OCH3); m/z (ESI) 393.20 (M+H+). 1-(11-(1H-Indol-3-yl)-5H-benzo[b]carbazol-5-yl)ethan-1-one (5a): Yield 5%; mp 100°C–105°C; IR (ATR) ν =3405 (NH) cm−1, 1735 (C=O); 1H NMR (acetone-d6) δ =10.41 (s, 1H, NH), 8.99 (s, 1H), 8.66 (dd, J =7.5, 1.5 Hz, 1H), 8.05 (s, 1H), 7.87 (dd, J =7.5, 1.5 Hz, 1H), 7.47 (m, 1H), 7.40–6.81 (m, 9H), 2.83 (s, 3H, COCH3); m/z (ESI) 375.41 (M+H+). 1-(11-(1-Acetyl-1H-indol-3-yl)-5H-benzo[b]carbazol-5-yl)ethan-1-one (5b): Yield 8%; mp 225°C–230°C; IR (ATR) ν =1732 (C=O); 1H NMR (acetone-d6) δ =8.90 (s, 1H), 8.65 (s, 1H), 8.33 (m, 1H), 8.20 (m, 1H, 6-H), 8.07 (m, 1H), 7.82 (dt, J =8.5, 0.9 Hz, 1H), 7.59 (dd, J =8.1, 2.9 Hz, 1H), 7.64–7.41 (m, 3H), 7.14 (m, 2H), 7.00 (m, 2H), 3.05 (s, 3H, COCH3), 2.82 (s, 3H, COCH3); m/z (ESI) 417.66 (M+H+).